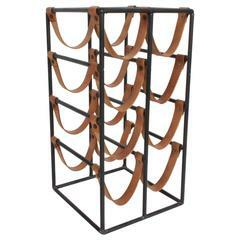 Single Arthur Umanoff swivel bar stool, wood slat seat, iron frame with Danish rush cord wrapped back. If you need another stool to complete your set, here is one that is left unrestored, so you can match. Frame retains original glides, some rust to frame, scuffs to seat. If you need restored to seat and frame inquire on cost. 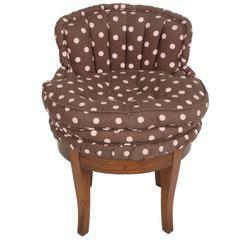 Vintage 1940s Swivel Vanity stool, with tufted polka dot fabric. Legs to be touched up prior to shipping. Fabric is clean, but may want to update. Seat depth 15.5". A pair of iron, wood and jute bar stools by Arthur Umanoff. The swinging 1960s! Two 1960s wrought iron stools by Arthur Umanoff, Rye and Gin with orange vinyl seats. Seat height is 29.5 inches. Set of ten Arthur Umanoff bar stools. Pair of Arthur Umanoff MCM spindle stools. Stools have original vinyl upholstery and recommend new upholstery and refinishing, circa 1960s Dimensions: 17dia x 16t.